Using inexpensive ingredients and taking only minutes to put together, these Fresh Meat Red Velvet Rice Krispy Treats are perfect for your The Walking Dead viewing party! 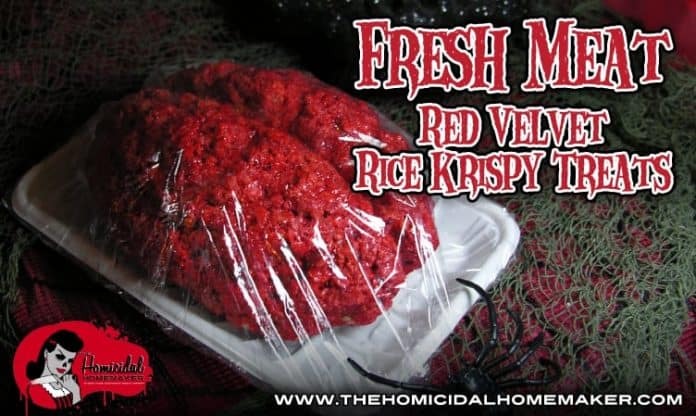 Give Rice Krispies a Ghoulish Twist with Fresh Meat Red Velvet Rice Krispy Treats! You didn’t actually think I would forget to post a ghoulish recipe right before the return of The Walking Dead this Sunday, did you? Back in 2009, while I was performing with my dance troupe The Horror Dolls, we were scheduled to perform at a horror convention about four hours away. Knowing that our gelatin-based gore and brains that we utilized (and ingested) for our performances likely wouldn’t hold up during the drive and heat, I was desperate for another inexpensive option. I happened to have both marshmallows and Rice Krispies on hand, so I got to work, added a little food coloring, and the next thing I knew, I had created Rice Krispy Treats that looked exactly like raw meat. UPDATE 01/18/17: I have made a video update for this recipe! Click here to view, or watch below! Long story short, our Rice Krispy Treat “raw meat” was unnervingly effective, and now, I am going to share my latest twist on the recipe with you – a yummy Red Velvet version that uses a cake mix! Using inexpensive ingredients and taking only minutes to put together, these Fresh Meat Red Velvet Rice Krispy Treats are the quick and easy recipe you need to make for your viewing party of The Walking Dead! I used Loran Oils Red Velvet Flavoring Emulsion, but if you don’t have it, vanilla extract will work just fine. Alternatively, if you don’t have Red Velvet cake mix on hand, you could simply just color the melted marshmallow/butter mixture with food coloring! 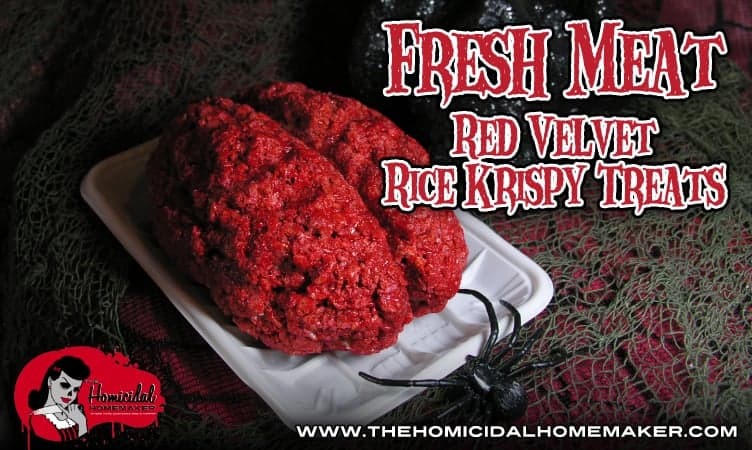 This would also make a fun treat for the beloved ghoul in your life on Valentine’s Day. To really seal the deal, I recommend going to the deli and asking for a few (unused) trays to serve your Fresh Meat Red Velvet Rice Krispy Treats on. Wrap them up with some clear plastic wrap, and the other members of your household might accidentally try to turn them into something you would fire up the grill for! For vegan variation: Use EarthBalance or other vegan margarine, and vegan-friendly marshmallows. Lay out a sheet of parchment or wax paper. To prepare in microwave: In a microwave safe bowl, melt butter and marshmallows in 30-second increments, stirring frequently and being careful not to scorch or burn the mixture – watch it closely! Once butter and marshmallows are fully melted and mixed together, add 1 teaspoon of the Red Velvet Emulsion (or vanilla extract + a drop of red food coloring) and mix well. Gradually stir in the 1/2 Cup of dry Red Velvet Cake Mix. (NOTE: if you are not using the cake mixture, simply add your food coloring to the melted marshmallow/butter mixture.) If mixture seems too thick, microwave for a few seconds or add in a little bit more melted butter. Add in the Rice Krispies cereal and mix until combined – start with 3 Cups and only add as many as you need. Around 3.5 Cups worked perfectly for me, but depending on the temperature/humidity or even the varying brands of marshmallows, you could need more or less! Spray your hands with cooking spray, or grease them with butter, oil, or shortening. Remove the mixture from the bowl and onto the parchment/wax paper. Shape into desired shape – be creative! Make a single ‘brain’ like I did, or make cute individual sized brains to serve up on a platter…or simply just throw it onto the tray! Garnish with a blood sauce, such as a berry coulis, grenadine in corn syrup, raspberry agave, etc., if desired, and dig in! Can this be done just on a stove instead of just a microwave or is it essential in order to maintain certain temperatures? Hi Lokke! Thanks for checking out my recipe. These can absolutely be prepared on the stovetop! The stovetop method actually results in a gooey-er, chewier rice krispy treat, which is actually more tasty (in my opinion!) but may not hold complex shapes as well, so for something like this, you might have to add a bit more rice krispies to the mixture. It’s one of those things that you sort of have to eyeball – sometimes humidity, or even the brand of marshmallows you use, can slightly affect the end results. To prepare over stovetop: Melt the butter in large sauce pan, over low heat. Add the marshmallows and stir until melted and well combined. Cook 2 minutes longer, stirring constantly so the mixture doesn’t scorch. Remove from heat and add cake mix, flavorings/colorings, and cereal, and stir until well-coated. hi, I was wondering if the half cup of red velvet cake mix is just the powder on the boxes they sell in grocery stores? you basically don’t cook anything.. right.